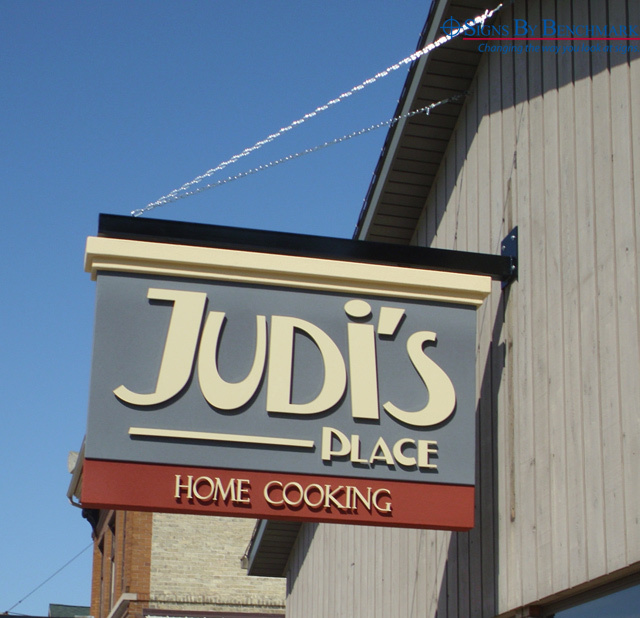 When the Primecast Advertising Inc. team (Grafton, Wisconsin) received orders for restaurant signage, they called Signs By Benchmark. Having worked together on previous projects, the two companies got to work creating the perfect lightweight, projecting signage that would call the hungry. 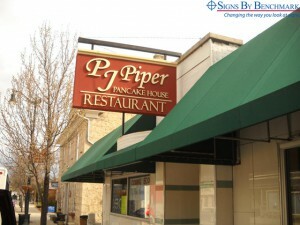 Tom Lubner of Primecast Advertising met with his customers to determine lettering fonts to match those used in each restaurant’s literature, including menus. He then designed the signs and arranged for the manufacture of appropriate Gemini letters that were shipped to Signs By Benchmark for installation. This allowed the Primecast team to immediately install both signs upon their arrival. 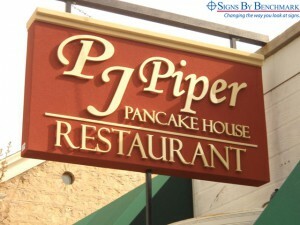 The sign created for the PJ Piper Pancake House features a two-color acrylic stucco finish. Also constructed from cellular plastic around an interior metal framework, this 72″ wide x 40″ high x 10″ deep projecting sign with Gemini letters has no problem calling the community to breakfast. 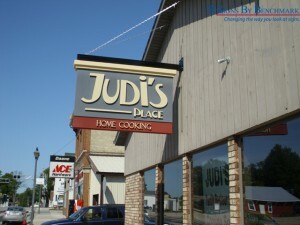 According to Lubner, installation of both signs was an easy job. Working with flexible cellular plastic allows Signs By Benchmark’s creative team to CNC-cut and hand-sculpt products that aren’t easily manufactured from traditional mediums. 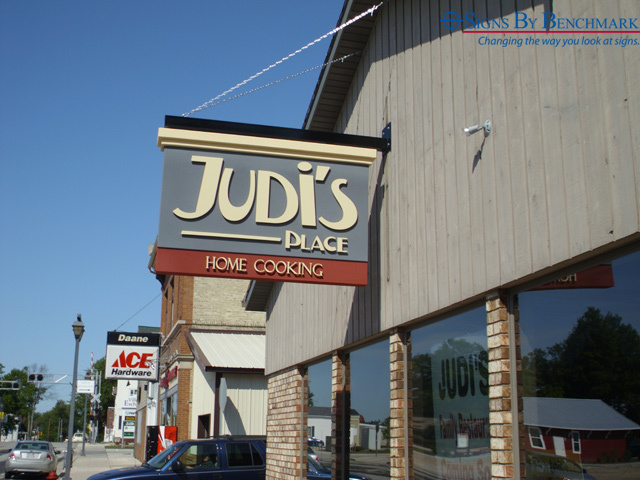 Every sign or sign component such as bases, pole covers and sign tops are completely encapsulated in Signs By Benchmark’s signature hardcoat for long-lasting strength and durability. 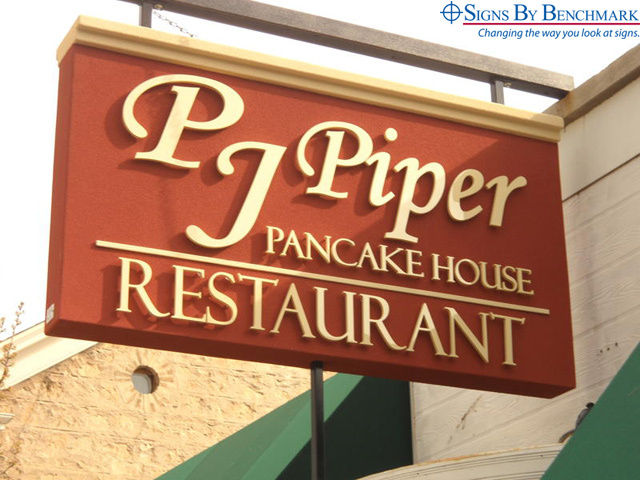 Give the team at Signs By Benchmark a call at 800-658-3444 to discuss high quality lightweight, durable signage for your customers.